We’ve partnered with Blue Lizard Australian Sunscreen for this post because who doesn’t want to “go Austrailian” on protecting our kids from the sun, mate? Children are not always a fan of… a lot of things. Washing, seat-belting, eating, taking medicine, being sunscreened, wearing clothes. They’re often furiously disinterested in and agonized by all the things in life that keep them, well… alive. Haven’t you ever looked at your child, shook your head, and wondered to yourself if they really even want to remain uninjured, well and alive? Not so much, it seems sometimes. That’s where parents come into the circle of life: to keep kids alive. Despite their efforts to run through rain or a busy parking lot, practice juggling knives or sticking them in power sockets, or eat anything (food or not) that they can (or can’t) fit in their mouths. As their parents we’re their gaurdians and their rescuers (especially from themselves), so we tend to want the best, the safest, the strongest, the softest, the healthiest, the everything-est when it comes to them. It’s only natural us child-owners would want to “go Australian” on sun protection. And we’re not just protecting them, we’re also protecting ourselves from the guilt and torment of a lobster-colored child who can’t sleep, wear clothes, sit in a car seat or poop without sobbing because “it huuuurrrts.” The poor little psychotically reckless munchkins. Aside from being made in America and originally formulated in the part of the world with one of the roughest places on Earth to survive, Australia’s Outback, their sunscreen scores very well on EWG.org (this is a huge point for our both our natural-centric and toxin-concious families). They didn’t ask us to say any of this and just wanted to create something fun for our audience so you all could get to know them. How rad, right? LOL that was hilariuous. 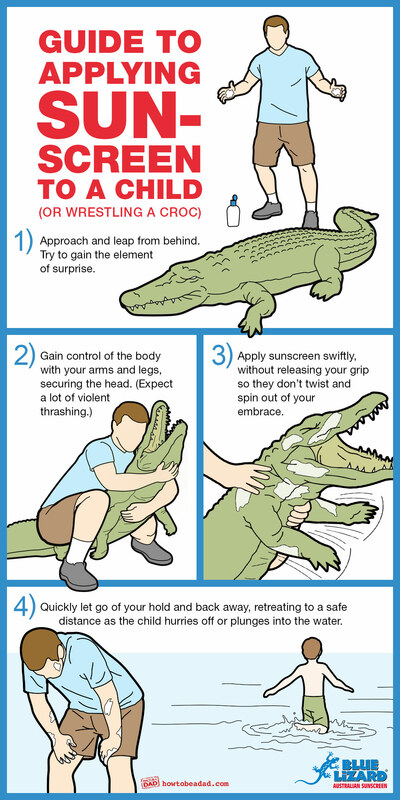 I myself face a crocodile every day during summer… not an easy ride.